A few years ago, the members of a parenting group I belong to were discussing a letter sent home regarding school Halloween treats. This particular school was concerned with fat count and all treats had to be within certain fat guidelines. Other schools have allergy restrictions or limits on sugar. Some schools require only pre-packaged food for insurance reasons. This feels like another parenting hoop to jump through; but with so many treat-filled holidays, it is understandable. That’s a LOT of sticky clementines. So, I searched the web and found some alternate ideas for school Halloween treats. Not every one of these ideas is going to fit every dietary demand and some will be less expensive than others. Hopefully this round up will give us some ideas. 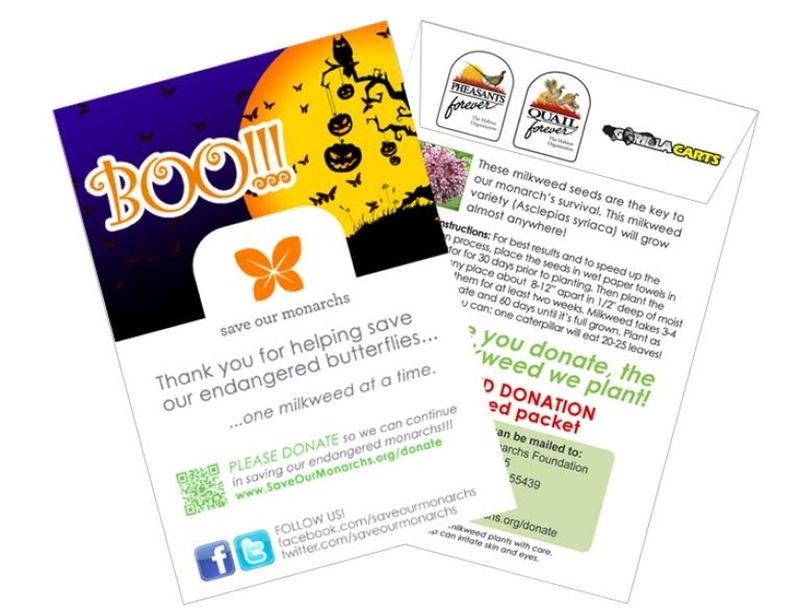 Halloween Seed Packets from Save Our Monarchs. Even in small classes, kids get plenty of edible treats at a Halloween party. For the last couple years, I have chosen to skip food completely and pick something else. I don’t want to be the toothbrush mom, but I found a couple ideas that are fun enough to be appreciated. My two favorite non-edible treats for 2017 are Comic Books and Seed Packets. Last year we did the comic books and they were a hit. Local Comic Books Shops who celebrate Halloween Comic Fest will also often carry packets to purchase for giving out. A couple packets cost us about the same amount as a large bag of candy. Pre-packaged is a reality in many schools. My understanding is that this is an insurance regulation to protect against lawsuits in the case of food poisoning. I’m not a fan of this regulation since I think it focuses on a less likely short term risk without much thought to the long term issues with many pre-packaged foods. However, you can find pre-packaged treats that are also healthy. Here is a link to 31 Healthier Store-Bought Snacks (Under 150 Calories) from Greatist.com (warning: there is an irritating email signup pop up on this site). Once you get your store-bought snacks home, let your kids make them “Halloween Treats” by coloring these Printable Halloween Treat Bag Toppers from Thrifty Little Mom. Maybe they can even toss in a Halloween Joke. Making Memories With Your Kids has joke printables here. The best part of this plan is that your kids should be able to do the assembly themselves. You can set them at the table with crayons, scissors, a stapler and supplies while you do the dishes (or read FamilyFunTwinCities, whatever). Okay, I’ve never actually heard of a school requiring fruits and veggies in place of candy Halloween treats, but it could happen, or maybe you just want to balance the sugar high with something substantial. Here are some of my favorites that I found around the web with links to how to do them. These could get pricey depending on where you shop. My neighborhood Aldi usually has good produce at good prices. Clementine Jack-o’lanterns via MyFitFamily.com. This was our choice a few years ago when we had a baby due a month later; I wanted super easy that year. Dipped Ghost Pears via The Kitchn.com or flip them over and they become skulls similar to these by Super Healthy Kids. For a less perishable school treat, I’d probably dip them in chocolate rather than peal them. Frogs and Snails and Puppy Dog Tails shows how to make Apple Teeth. They use marshmallows for the teeth. I’ve also seen almonds and candy corn would make great teeth. Halloween Vegetable Cups via Passion for Parties. I bet you can get everything you need to make these cute vegetable cups at the dollar store. Than pick up a bag of carrots and a bag of celery and you can whip out a classroom size of these in an hour. I wish I was a cookie baker. I’m not. I don’t mind mixing up the dough, but I hate rolling them out and cutting them over and over again. Luckily kids kind of like that part. If you are in the mood for cookie baking, Not Quite Nigella created these adorable VooDoo Doll Cookies. Follow her dough recipe, buy the packaged dough, or even find a healthier version — your call. Are you old enough to remember getting real home-made popcorn balls for Halloween? There was a little old lady down the street who was a hold-out when I was a kid. The neighborhood knew her, so we were allowed to eat them. Honestly, I hated them — compared to candy. Also, according to Christine at Cook the Story, who did the research, real popcorn balls are not particularly easy to make. So she created these easy popcorn balls for Halloween. They are made like Rice Krispie Treats. Another traditional Halloween treat is pumpkin seeds. Unless you are lining your front porch with jack-o-lanterns, you probably couldn’t make a big enough batch for a whole class, but maybe as a small addition, to another treat. Ninja Mommers claims to have directions for roasting perfect pumpkin seeds. Heather from Life Gluten Free made these adorable banana and coconut ghosts. These are so cute, I kind of want to make them for fun. I probably won’t freshly squeeze my own orange juice though. Nut Free is a reality for many schools. If that is the only regulation your school has, your kid can bring candy! Here’s a list of Nut-Free Halloween Candies from Peanut Allergy.com. I doubt any school will require vegan treats, but if you are vegan and its important to you to share a treat you would personally eat and give your kids, Fork and Beans shows you how to make Vegan Peeps in a cute little ghost shape, and if you are not vegan, these are still awesome. Still want more ideas? Check out these articles from Non-Toy Gifts: HEALTHY HALLOWEEN TREATS FOR SCHOOL and 25 NON-CANDY HALLOWEEN TREATS. These treats look so good. I wish it was Halloween today. It feels a little like Halloween 1991. Manuel. You are so right. I personally missed that iconic Halloween, but blizzards make me want candy!